Coffee is one of the biggest commodities in the world and most of it (more than 60%) is consumed in the workplace...so “OFFICE COFFEE” is something big! Furthermore in South Africa there are over 1,200 coffee roasters and importers of all kinds of coffee makers. The European and Chinese equipment manufacturers are not making it any easier. Options are plenty...and somewhat confusing...bean-to-cup, capsule, filter, instant, automatic, manual…? ...and where do you buy it from? Take-a-Lot, Makro or where you know you can "talk to a person"? ...and what happens if the thing breaks? ...and what if John, the CEO, doesn’t like the coffee? ...and the cost...a fancy coffee machine is just going to cost too much...right?...wrong! Since 2001 we’ve been focusing on bringing great coffee into offices around South Africa. From the outset we realised the support of our clients will be key to the ongoing success and growth of our company. Hence we are still, to this day, the only coffee company with a national franchise network to ensure a personal relationship with each of our clients - from Polokwane to PE & from Pofadder to Port Edward. We started small, but we grew consistently every year. People like a good cup of coffee, and they want jacked-up support. It is really as simple as that. - two large roasting & packing facilities as well as technical workshops in Cape Town and Johannesburg, we employ our own technicians to work on your machines, we prefer not to outsource. - an ever growing range of products including coffee, milk powder, care products, hot chocolate, consumables, etc. 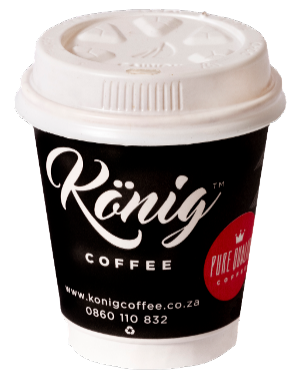 - Visit any of our König Coffee Shops, opening one by one in your neighbourhood we are well set to support any client needing great coffee in their office anywhere in RSA.